VERSOL, with our Steam Specialised team, can offer turnkey solution for the Steam System which can include Steam Boiler selection, selection of Steam Accessories, Steam Trapping, Steam distribution, Steam Heated Hot Water Generation, Steam distribution and networking for laundry or kitchen applications or Sterilizing in hospitals. 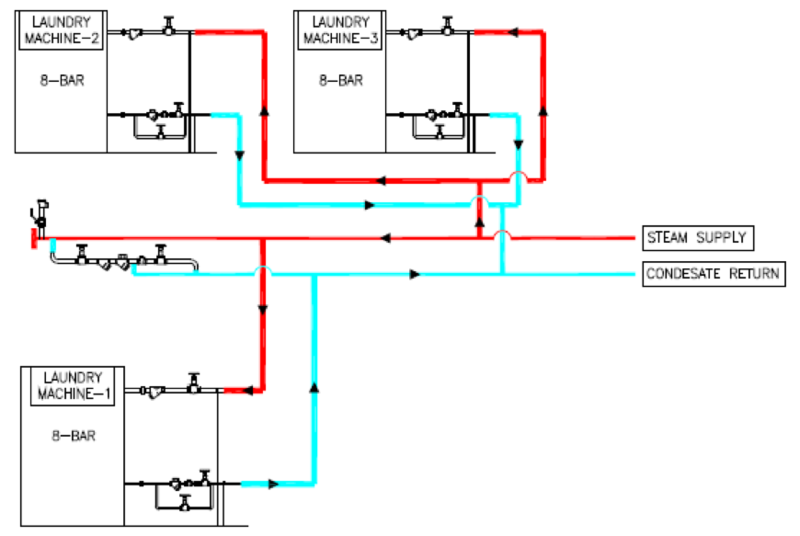 VERSOL can provide detailed design and drawing for Steam System and networking with VERSOCALD series Boilers. Brine tank water softener eliminates the hard-mineral contents of cold water supply and then this softened water is stored in feedwater tank of capacity. Capacity of feed water tank is 3 times capacity of steam boiler used. From Feed water tank Feed water pump set supplies water to Steam boiler, each steam boiler has its independent feed water pump set, These feed water pump set is working in Duty-Standby basis. Feed water is undergoing chemical treatment with the help of chemical dozing unit prior to the supply to steam boiler. Chemical dozing unit help to maintain the PH value in the desired limit. Steam boilers on Duty-Standby basis, duty change interval can be set as per customer requirements in site. Each boiler has its own control panel which will control the heating operation. Steam Boiler which holds steam train allows LPG/Natural Gas to reach burner unit at desired pressure, where combustion happens with the help of oxygen and ignition generated. 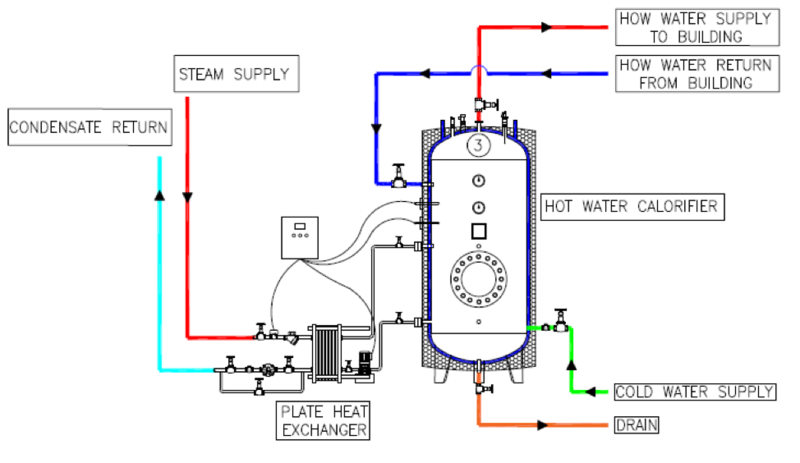 Steam boiler converts supplied water to steam using heat developed during combustion and this steam is directed to stem header through steam isolation valves. 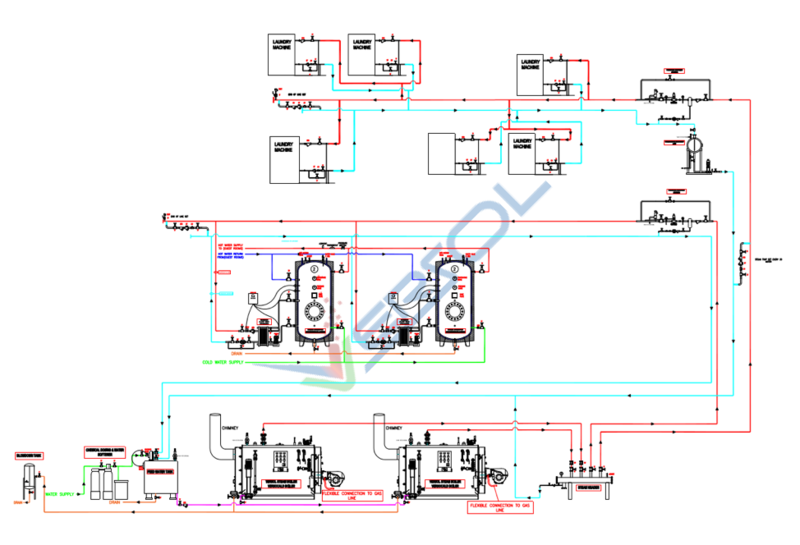 Steam header collects and divides the generated steam to different areas of application. Here to domestic hot water calorifiers and laundry room. Area of application can be Hot water generation or Steam distribution and networking for laundry or kitchen applications or Sterilizing in hospitals. Steam header supplies steam through PRV station at desired pressure rating depends on area of application of steam. After the steam usage of equipment remaining condensate is transferred to condensate recovery pump through steam traps from where its pumped back to feedwater tank. Blowdown tank will remove the remaining hot water in the boiler to avoid chances of scaling. The remaining flue gas in combustion will be directed to atmosphere through chimney.